Leaving town is always hard. Especially when the forecast is rain. And rain there was. 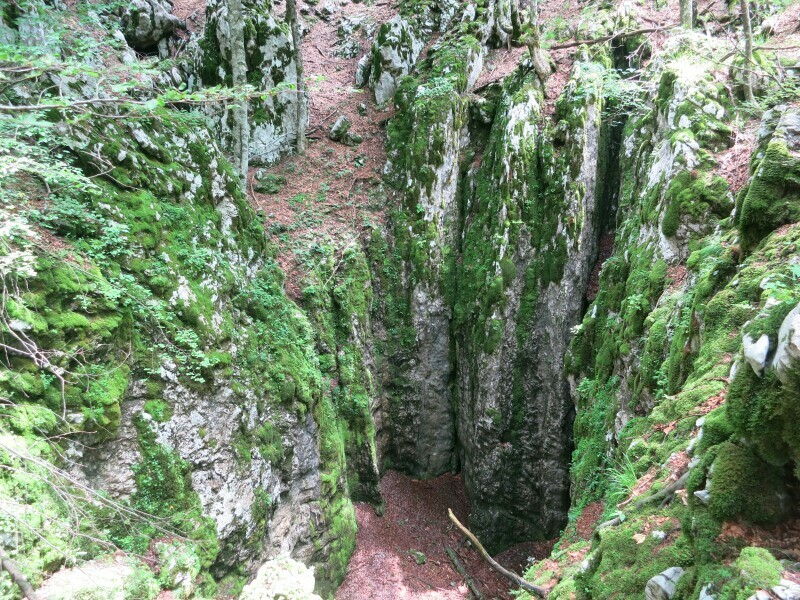 I hiked the shortest/fastest trail to Ŝugarska Duliba; about halfway there’s a crossing and two choices to get to the shelter. I quess the other one’s more scenic, but who cares when get soaked by the rain? I later find out that there’s a new shelter (5-person, solar panels and water) on the Dinarica-choice, it’s not on the maps yet. 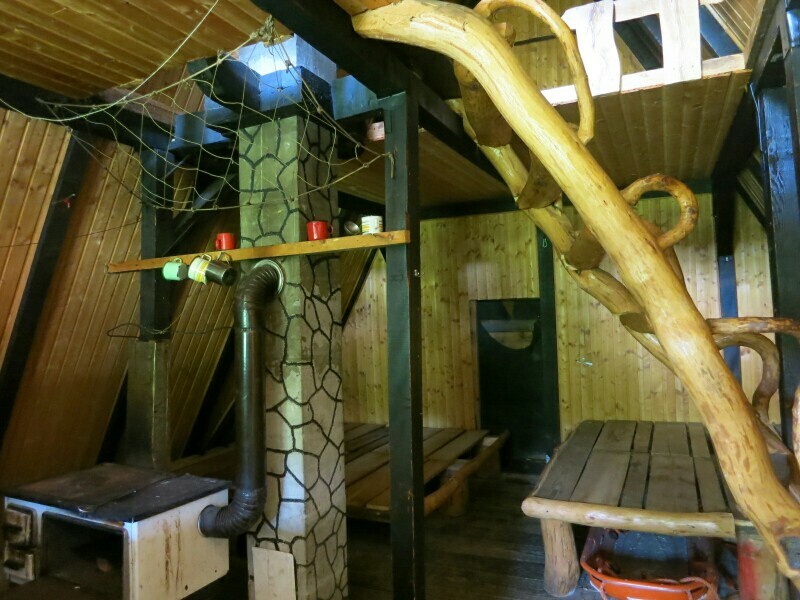 Another hiker just left Ŝugarska duliba (the wood stove’s still burning), which helps drying my clothes and gear. This shelter is in an awfull state, it’s a big mess, dirty, run down, taken over by Puh and other critters. 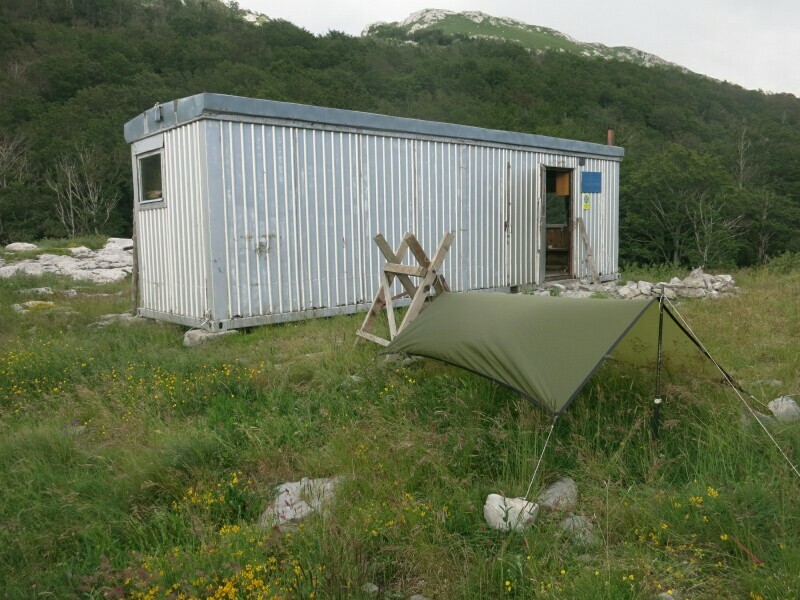 At the beginning of the evening the weather changes and I decide to sleep outside, under my tarp – save from the Puh. There’s a cistern close by (there are some good camping spots here too). The shelter is now closed for renovation (yeah!). The next day it’s a short hike to the shelter (5 to 6 hours). Heading on is not an option, the next shelter is too far to hike to the same day. And; camping is only allowed next to the shelters in the national parks. The first half of the hike is really good; views on the coast, hiking through shaded forest, etc. Then, after the ruins of forest house Juliba a logging area starts. 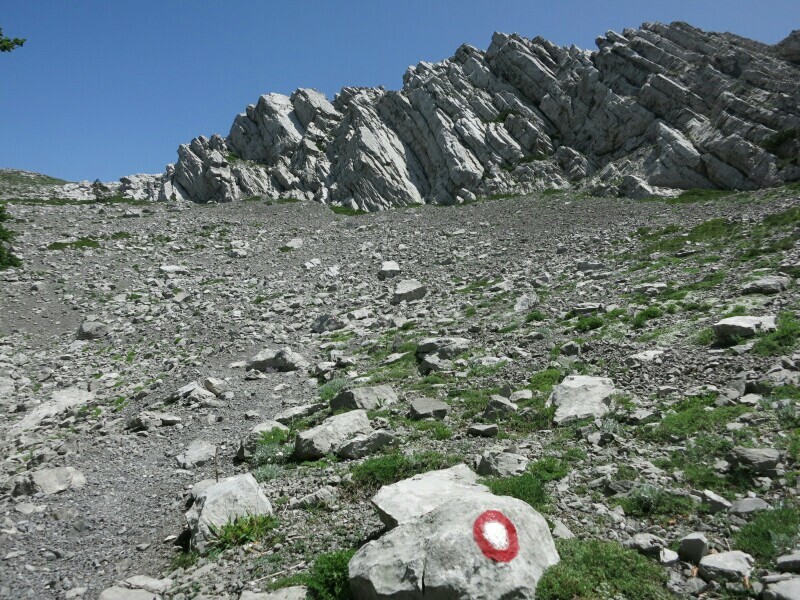 There are signs, but some are easy to miss and there’s also a lot of ruined trail. So keep on checking if you’re still on it (or somewhat on it). 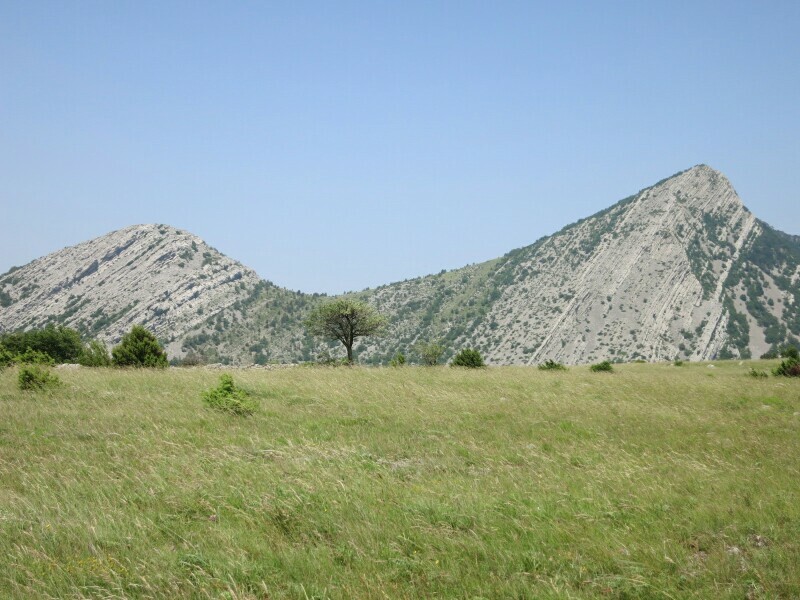 After the logging area it’s time for a treat: great views on those beautiful Karst peaks! On an amazing spot, surrounded by high peaks there’s Tatekova koliba. This shelter is being taken care of, it’s small but nice. Closeby runs a little stream (use the one after the shelter, the first one’s being used as a toilet area). If the stream’s dry there’s a water pump a little down the trail. Again, I slept outside, since of the Puh and also because of the warm temperature. There’s a donation box inside the shelter, don’t forget the leave some money for maintenance. This morning I start my hike early since I’m expecting it to be warm. 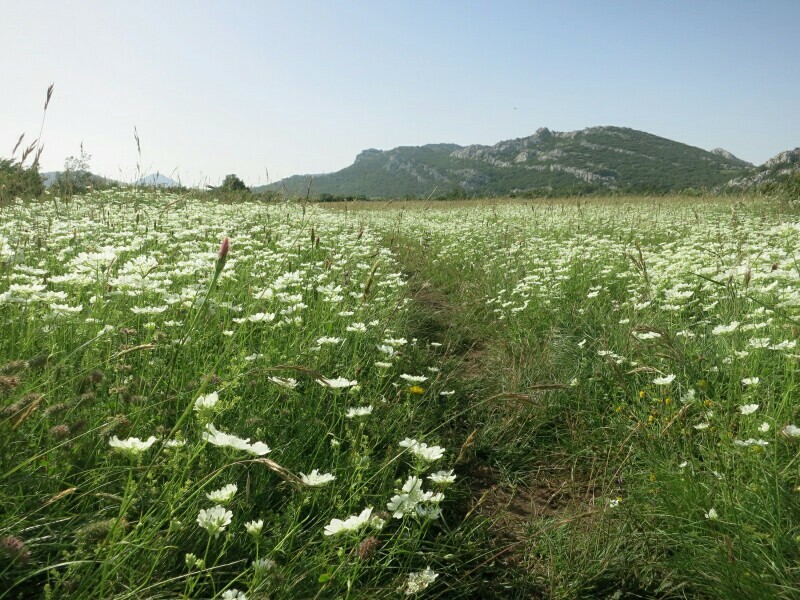 Today there’s a lot change in scenery; the hike starts with views on the Karst mountains, then forest and then green hills full of flowers. Along the way there’s a few cisterns containing water next to ruined houses. Like all water from cisterns it needs purifying, but if you’re a thru-hiker you’re probably carrying a filter anyway. Next is a plain. It’s beautiful but exposed, so burning hot and annoying flies everywhere. At the chapel I take a break. Here are benches and shade and most important; a cistern. A little after here the climb up to Struge starts. 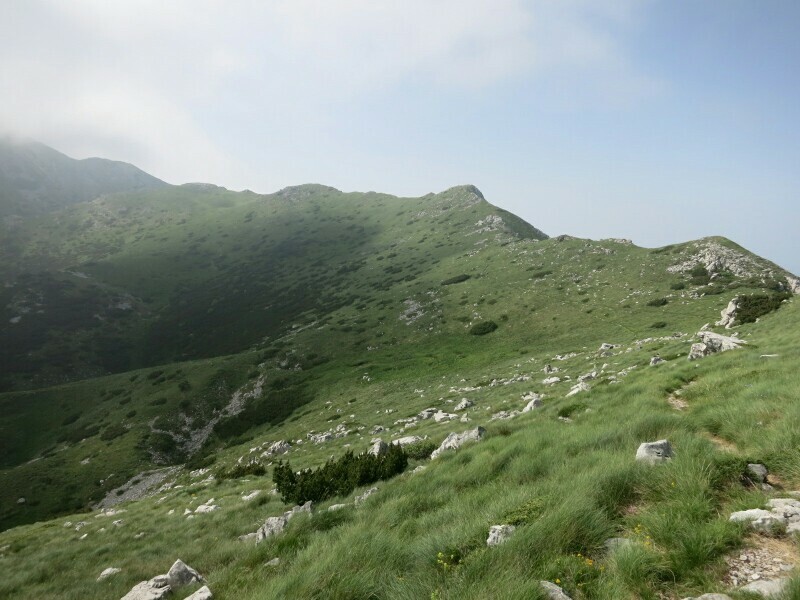 It’s about 500 meter uphill and got stunning views. The trail is nice and well maintained. There are even two springs on the way to the top. Struge is a nice and busy shelter. This is were I meet other hikers for the first time in days. Two day-hikers feed me speck (bacon), bread and onion. ‘Please eat. Don’t be ashamed you need it to hike to Macedonia’. This is also were I meet Ivan and his friend. Two well-informed hikers. Do you remember the dog? Well it’s common for him to walk along with hikers. He always returns to his boss at Skorpovac. 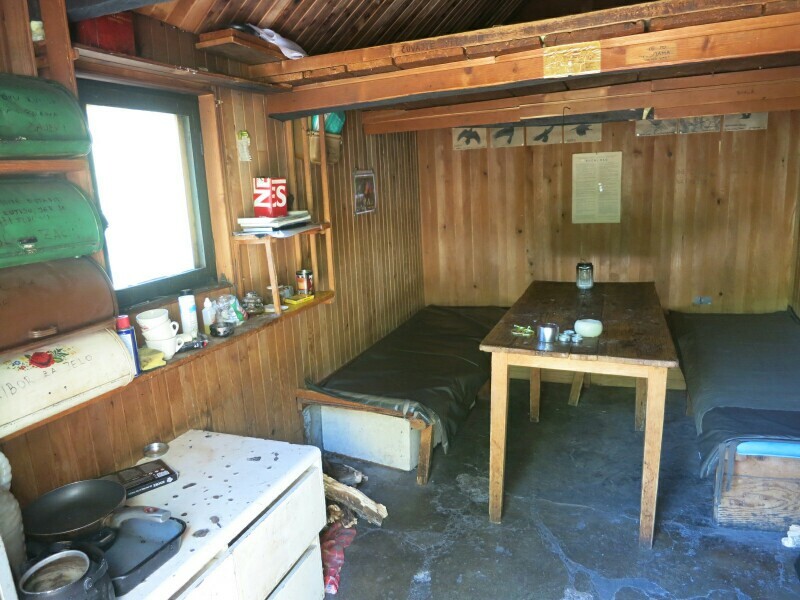 They also show me pictures of the new hut I missed near Baŝke Oŝterije and they tell me that the next hut has been torn down. They invite me for dinner too; risotto with homemade speck and cheese. Yumyum! Again in Struge there’s mice, Puh and other animals living in and around it. 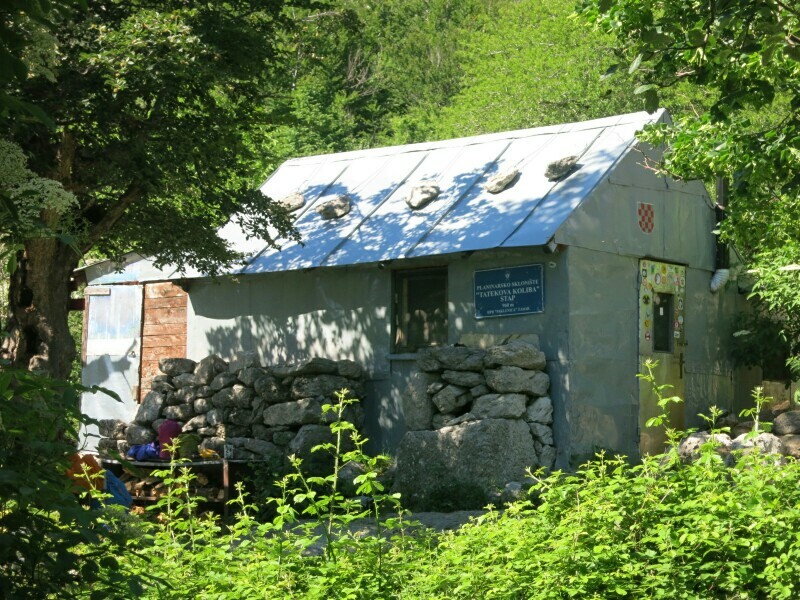 Water can be collected from a cistern, which is a 20 minutes hike from the hut (or carry water uphill taken from one of the springs). 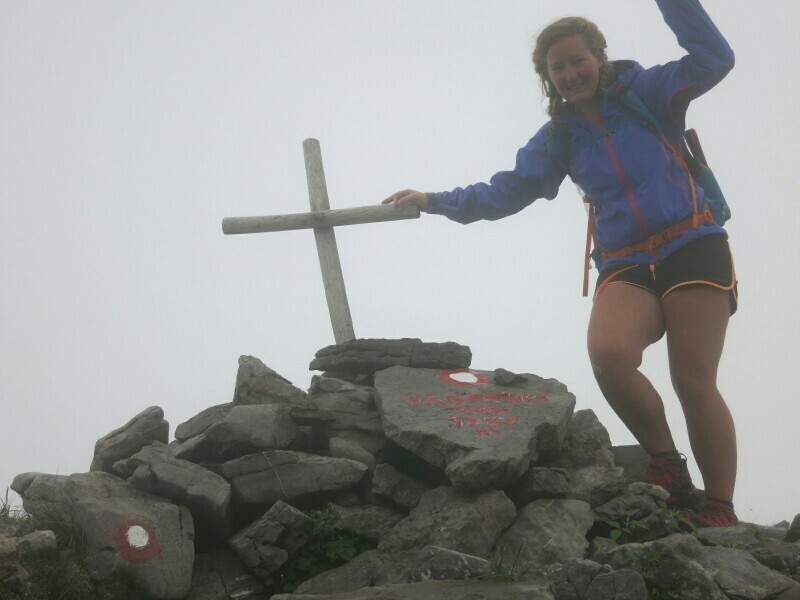 I start my hike early since I want to reach Tulove grede as early as possible. 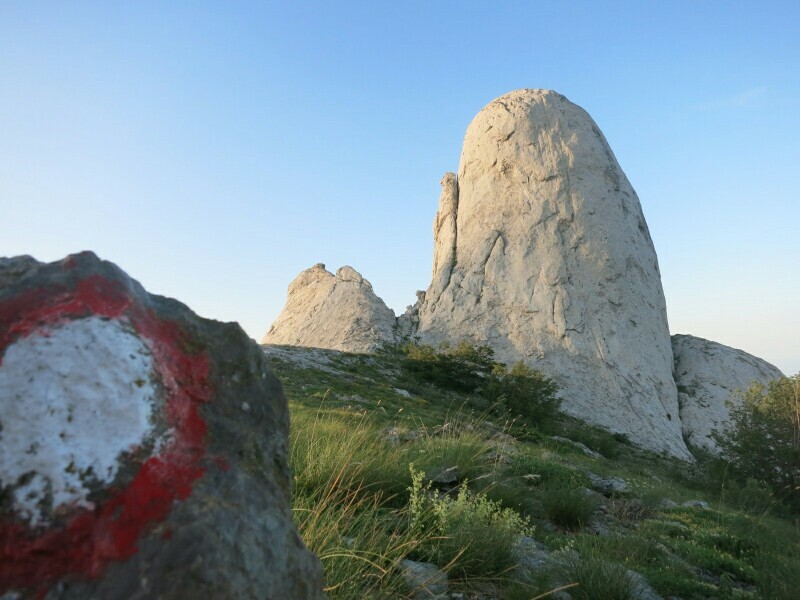 First is the ascent to Vaganski vrh., the highest peak in NP Paklenica. Although I hiked in the mist most of the morning, the views are stunning and I really enjoyed this part of the trail! Shelter Vlaški Grad doesn’t exist anymore. There’s a cistern close by and a little further down the trail there’s a spring – it only had a small trickle. Just before exiting NP Paklenica there’s a spring, fresh and delicious water coming straight from the mountain. This is also where a plain starts. From now on the hike is exposed and blazing hot! There’s almost no shade and no water sources. After the plain an endless road starts, it does have stunning views. Even though I tried to avoid it, I hike this part of the trail in the full heat. This area has been heavily affected by the war, don’t go off trail. At Tulove grede there’s a little bit of shade. Here I decide to try to hitch back to civilization. There’s quite some tourists driving up here and there’s no suitable spot for bivouac (mines and very exposed to both weather and muggles). This road is only used by either hikers or tourists (most of being driven by in a 4×4 and on a photo safari). Don’t count on an easy hitch here! 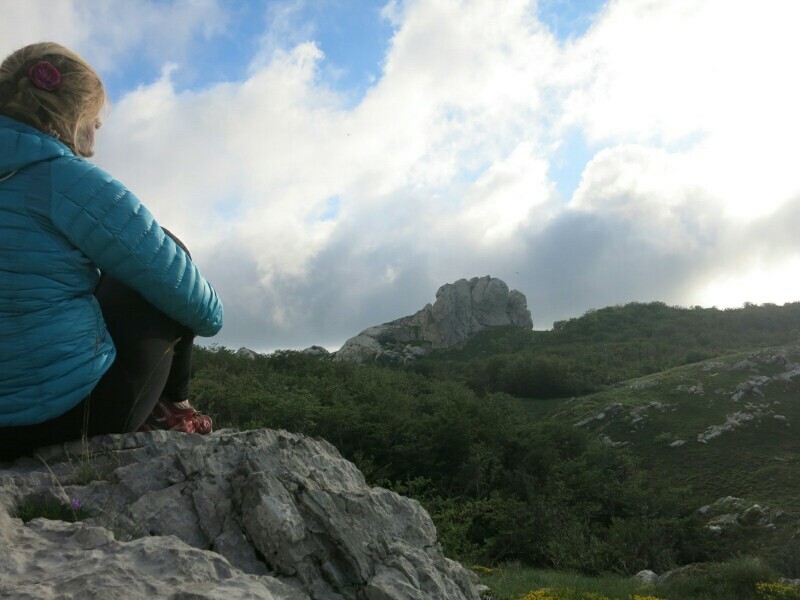 After waiting for a long time, at a parking lot occupied by three cars, three Slovenian hikers give me a ride to Starigrad. Way out of way… but I’m very happy to get this ride. Stage 19 is in my opinion not a pleasant stage to hike. It’s very exposed and since of the mine situation its not safe to go off trail. Therefore I’m skipping the remainder of this stage. If you’re planning on hiking this, make sure you got a good (better) strategy then I had. I’m also skipping stage 20 and 21. It will be hard to reach the start of stage 20 and after the climb to the summit there’s a lot of road-walking. Stage 21 leads over paved roads and through rural areas – I guess finding spot for bivouac (out of sight) will be difficult. 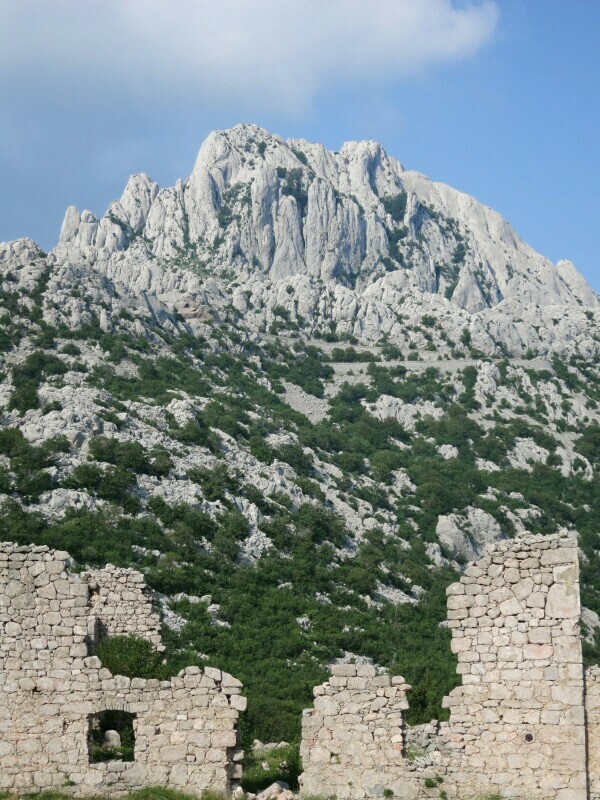 So from Starigrad I will travel by public transport to Knin to hike Dinara, Croatia’s highest peak. Check this link for GPS-tracks and more info. 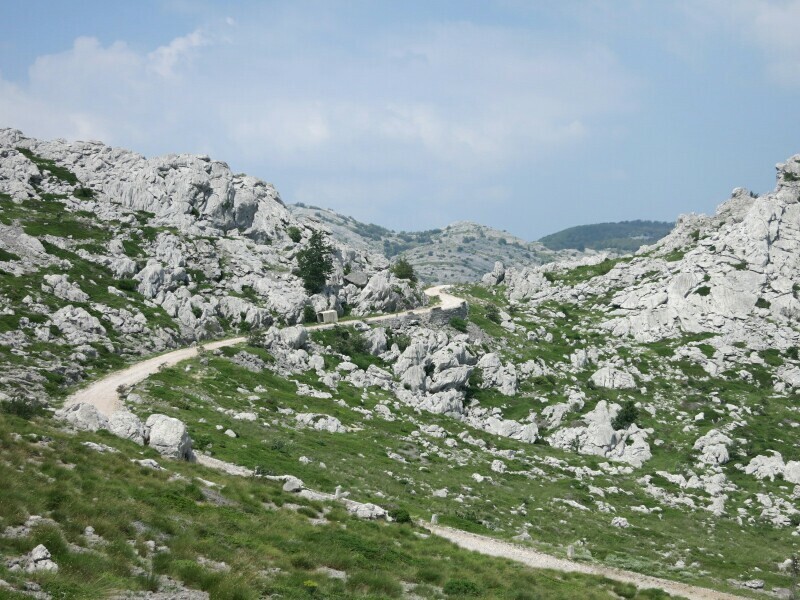 Some of these stages are part of the Velebit hiking trail. Check this link for more info. More pictures on Instagram. Support my adventures and buy me a refreshing soda pop. This blog has been written on trail and on a mobile phone.